Original Flick Trix finger bikes 3 piece park set including the bowl, platform, and half pipe all in the original boxes. I think there are 1 or two parts missing it is not 100% Complete. MANUFACTURER: Trix (Minitrix). COUNTRY: Germany. ITEM NUMBER: 006125_021037. YEAR ADDED TO COLLECTION: 2007. MANUFACTURER: Trix (Minitrix). COUNTRY: Germany. ITEM NUMBER: 006124_021038. MANUFACTURER #: 15357. YEAR ADDED TO COLLECTION: 2007. This is a beautiful Porsche Boxster with unbelievable details. I bought this model at the Porsche factory museum many years ago. A must for any Porsche enthusiast. Flick Trix. with WALL GAP. Display Case And Bike. New in cards. Cards good but not mint. You get the exact set of 6 shown. Flick Trix gives you superior performance and realistic details you can’t find anywhere else. Real bikes. Unreal Tricks. Organizes and displays your Flick Trix BMX bikes. Allows you take your Flick Trix BMX bikes anywhere. TRIX TRUX Powerful 4 Wheel Drive Set. New In The Box. TRIX TRUX Powerful 4 Wheel Drive Set. New In The Box. Condition is New. This is the only complete set on eBay. It includes an extra Krillin bike. 11 bikes overall. Flick Trix Micro Riders. Half Pipe Included. Trix TruX Monster Truck 4-Wheel Drive Toy. Official As Seen on TV product! MODEL: Porsche Boxster Speedster. 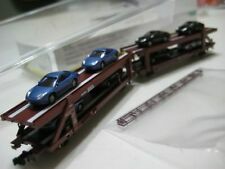 MATERIAL: Diecast. COLOR: Orange. COUNTRY: China. ITEM NUMBER: 008461_013522. COLLECTOR'S REMARKS: Lovely model. YEAR ADDED TO COLLECTION: 1998. TRIX TRUX - Zipline Stunt Truck - 4 Wheel Drive - MONSTER TRUCK - Climbs - ZipLines, up for sale! Monster Truck that can zipline and climb! I will do everything I can to provide you with an EXCELLENT BUYING EXPERIENCE!! Skate Monster Case lot Flick Trix Half Pipe with 11 finger boards ramps more The ramp is in very good shape and still plays Comes with finger boards and bikes.. some are just parts but others are intact. Please review all pictures and decide for yourself. Comes from a smoke free pet friendly home. Flick Trix. with BARRIER. Display Case And Bike. Includes all 5 bikes pictured new in boxes. Gohan, goku, super saiyan goku, vegeta, and the alternate version of super saiyan goku. Hot Wheels General Mills Cereal Car Collection Lot (4) TRIX DECO DELIVERY, WHEATIES 70'S VAN, CHEERIOS 51 GMC C. O. E. AND CINNAMON TOAST CRUNCH 49 FORD C. O. E. CARS ARE MINT ON CARDBOARD. THERE ARE SOME BOWS ON CARDBOARD. THE CINNAMON TOAST CRUNCH HAS A CREASE ON BOTTOM RIGHT CORNER OF CARDBOARD. PLEASE LOOK AT PHOTOS TO HELP WITH CONDITION NEW ITEMS LISTED DAILY. Very famous with trick riders. This set is from around 2005. This is a good price. Contains one ramp set,two rails,one pair of pegs with axle. For use with all Flick Trix bikes. We will correspond if this should happen. Flick trix Bomber Bikes Lot of 5. Condition is New. Shipped with USPS Priority Mail. 2- Hoffman Bikes 1- Haro 1- Mongoose 1- Redline May have some shelf wear Sold as is and are New and unopened. This item is a Hotwheels Real Riders Boo Berry, Frute Brute, Trix. Includes: 1 DVD in English, 1 trick bars, 1 tool, 1 complete bike and 1 display stand. LUCKY CHARMS. HOT WHEELS. SEE PICTURES FOR DETAILS. ALL IN SEALED BAGS. REESE'S CHOCOLATE PUFFS. COCOA PUFFS. COUNT CHOCULA. COOKIE CRISP. The Case latch is broke. Otherwise in good condition. Flick Trix. with SCULPTURE. Display Case And Bike. This toy has been gently used and is in very good condition. The hinge and clip are in good working order. Condition is Used.No accessories. This is for folding case only. I WILL DO MY BEST TO FIX ANY ISSUE, BUT IF I DO NOT KNOW THERE IS AN ISSUE I CAN'T FIX IT. WE TRY TO TAKE THE BEST PICTURES POSSIBLE AND DESCRIBE EVERY DETAIL. WE DO A LITTLE LIGHT CLEANING. Unless otherwise noted, We attempt to note any defects such as creases, major scratches, scuffs, moderate print marks and any other major imperfections not visible in the scan. NASCAR - DIECAST #26 - TRIX - LUCKY CHARMS. RACING CHAMPIONS. RACING CHAMPION 1/64 SCALE NASCAR GOODWRENCH TRANSPORTER- D/C CAB - MINT - SH. NEW IN THE BOX. Just arrived this hard to find New RARE " Hoffman Odyssey " finger bike purple color , collectible item. Fast shipping . (missing plastic box). I put Batteries in the Tower & it works with announcing Racers, but I do not know how this works with Set. Batteries Not Included. Overall this would be a very nice Addition to any Display. The item is sold. Never opened. Rare color. A must for any collection. 1996 Band-Aid Die-Cast Car #21. Just arrived this Flick Trix Finger Bike Chrome color ( package says Redline but is not) , working pedals, pegs, wheels Collectible ítem hard to find fast shipping . 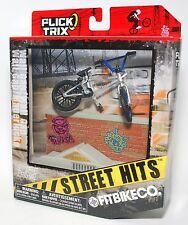 NEW Flick Trix Bmx Finger Bike " Dakota roche " Cycle Star Vehicle M01F. Condition is New. Shipped with USPS First Class Package. Factory Sealed and sold exactly as shown in the photos. Thanks for looking. Honey Nut Cheerios '51 GMC C.O.E.and the elusive, hard-to-find Franken Berry Custom '77 Dodge Van! Boo Berry '29 Ford Pickup. You are purchasing one Hot Wheels 2011 Pop Culture General Mills complete nine-car set. 2004 HOT WHEELS Cereal Crunchers. LINCOLN CONTINENTAL 1964 #115. HOT WHEELS IS MINT ON NICE, NON-MINT CARD. This is finished in RED & WHITE.